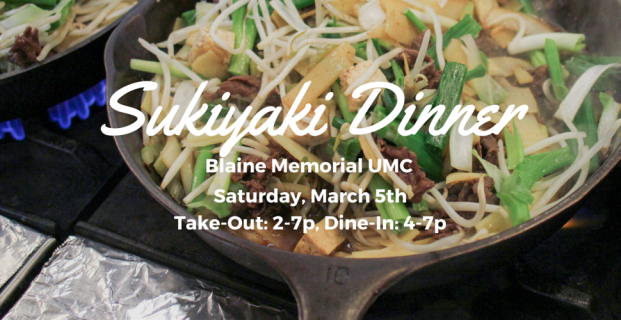 Join us for a Blaine Memorial tradition…Annual Sukiyaki Dinner! Enjoy traditional sukiyaki as well as home baked goods, and our Blaine Youth Group prepared specialty Suno Dogs & Italian Sodas. Take Out Hours: 2-5pm cooked/uncooked dinners; 5-7pm uncooked dinners only. Your support is vital to make this day a true success! Many will be blessed by your presence at this event as the proceeds will not only support our ministry but will also benefit a worthy cause in our global family, IMAGINE NO MALARIA – The United Methodist effort to treat, educate and prevent the spread of malaria in Sub-Saharan Africa.